Ailsa of Where’s my backpack? has proposed another photo challenge—it looks like it’s going to be a regular weekly thing! This week her challenge is Street Markets. I don’t have too many photos of street markets. Although I do remember photographing some wonderfully colorful ones in Germany, that was many years ago, and where are those photos now? But let it not be said that I didn’t rise to the challenge! And yes, I did travel to take this photo—from the East Side of Manhattan all the way to the West Side, from one culture to quite another. This entry was posted in New York City and tagged New York City, Photography, postaday, postaweek, postaweek2012, Street Market, Twilight, Weekly Photo Challenge. Bookmark the permalink. I used my British passport so as to remain neutral. 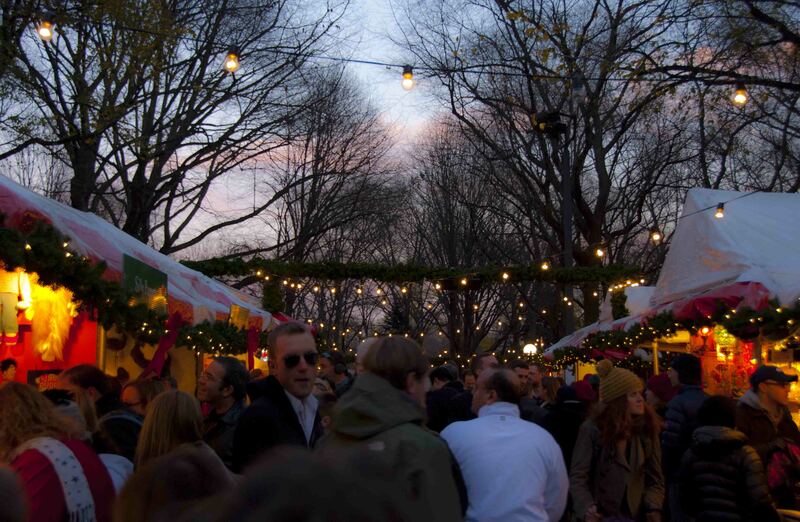 The twilight added a warm and festive feeling to the exciting street market. Beautiful! The twilight, the pink clouds in the darkening sky, the festive lights coming on, and the holiday season! Great photo. Love the colorful sky in the background. It looks like a lively place. Crowded, like everything in NYC. Thank you, Vladimir. She was one in a million. Yes, East Siders going to the West fear they might be eaten by ogres. West Siders going East just fear being bored. This is uptown. Downtown the rules are different, of course. Nice picture. by the way!